Villa Marta? If the town of Boquete ever erects a statue to one of its favored citizens, it should be in honor of Eduardo Gonzales. Senor Gonzales has turned the gardens of his home into a wacky and wonderful paradise called Villa Marta. 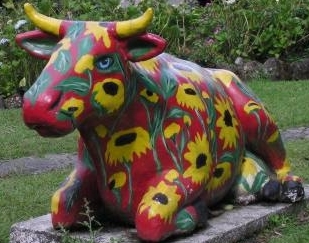 Open from 9 a.m. until 6 p.m., the gardens are located on the western side of Boquete They feature beautifully landscaping with an abundance of flora and some rather amazing artificial fauna – life-sized pop-art style cows and bulls. These fiberglass animal statues are dotted at random around this amazing garden. But wait, there’s more at Villa Marta. Recently, larger than life-size storks have been added, also painted in Picasso-like style. 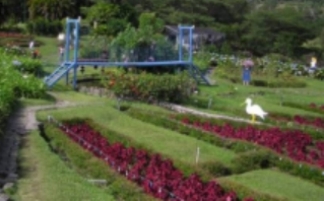 The gardens also feature a scaled version of one of Chiriqui’s famous suspension bridges. 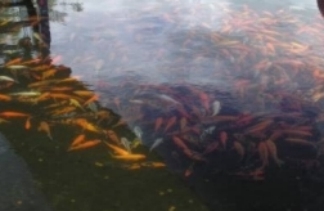 The bridge spans a large pond teeming with goldfish. The gardens have many unexpected surprises around every turn. Boquete has grown in size and international acclaim since I first visited it back in 1998.